Many of us are wild about canned salmon. Not only is it a versatile cupboard food, but as more of us are looking at ways to reduce our red meat intake, salmon, or indeed any fish, is a popular high protein and low carb alternative. Combine this with what we know about the health benefits of eating salmon then why we are so wild about it becomes clearer. This article will look at some of the best canned salmon available, examining what it is that makes these stand out from the crowd, not only bringing benefits to the table, but also our health and wellbeing. 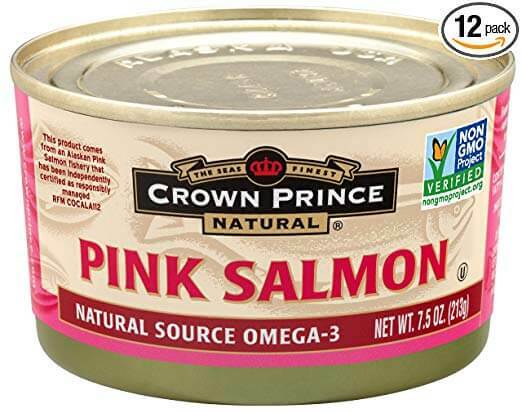 As non-GMO and certified sustainable, Crown Prince Natural Pink Salmon is a traditional, yet low sodium canned salmon. 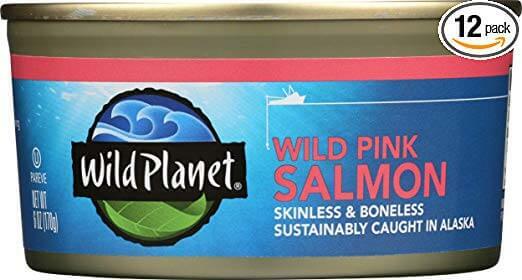 The Wild Planet Wild Pink Salmon wins hands down as our budget pick, offering a sustainable product at great value. This low sodium pink salmon is Non-GMO Project Verified and sourced from a wild fishery certified sustainable by the Alaska Seafood Marketing Institute (ASMI). This Natural Pink Salmon was also awarded the Marine Stewardship Council (MSC) certification which means that as a consumer you are buying from a responsible organization meeting sustainability targets set by the MSC. Crown Prince has been canning seafood since 1948 and because this natural pink salmon contains skin and bone, not only are you getting an extra boost of calcium from the bones, but also extra Omega-3s found in or near the skin of the fish. Available in two different size cans as well as being low sodium, it is also kosher. This Wild Planet Wild Pink Salmon is fished sustainably by local families in Alaskan waters. Non-GMO Project Verified, this boneless and skinless salmon is canned from fresh rather than being frozen first and each serving contains around 524mg Omega-3s. It is certified OU Kosher Pareve. The Monterey Bay Aquarium Seafood Watch Program recommends that salmon fished from the Pacific Northwest are considered a best choice for sustainability as Pacific salmon are one of the most intensively managed species in the world. Because the salmon are wild-caught, their shorter lifespan means they have not accumulated as much mercury as salmon from other sources, helping you to reduce some of your mercury intake. The average mercury level in Wild Planet salmon is 0.013ppm whereas FDA tests show an average of 0.014ppm in canned salmon. Like all canned salmon, the Bear and Wolf Pink Salmon is carb free, high protein and rich in Omega-3s making it an ideal addition to your diet. Although it is the smaller 6-ounce cans with BPA-free linings, Bear and Wolf Pink Salmon comes as a multipack of six which makes it easier to keep your cupboard stocked. 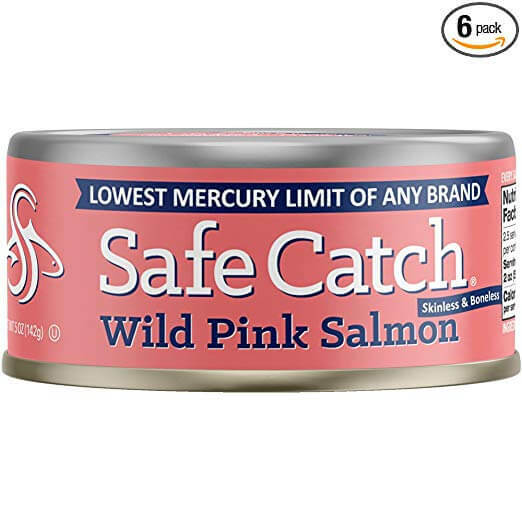 Containing premium wild salmon, Safe Catch Wild Pink Salmon offers a lower mercury option if you are pregnant, thinking of becoming pregnant or already have children. As each salmon is caught, it is tested to a mercury limit below FDA action limits and this testing is what has made it the official salmon for the American Pregnancy Association. The salmon is wild caught using sustainable methods in an MSC certified fishery. Safe Catch is also partnered with the Monterey Bay Aquarium Seafood Watch Program and Vancouver Aquarium Ocean Wise Seafood Program to help promote sustainability. As well as being hand packed to maintain freshness, the skinless and boneless Safe Catch salmon is also certified OU Kosher. This is Sockeye or red salmon, fished sustainably and usually canned on the same day that it’s caught, helping keep its fresh flavor. Canned red salmon is a great source of vitamin D with the USDA National Nutrient Database reporting it as being in the top ten foods for vitamin D content. Redhead Wild Sockeye Salmon is also kosher. You may notice that red salmon can be pricier than pink salmon, probably because of its richer flavor and higher fat content. One of the main differences between red salmon and pink is that red salmon stay in fresh water for a year when they hatch, unlike pink salmon which migrate straight to the sea on hatching. 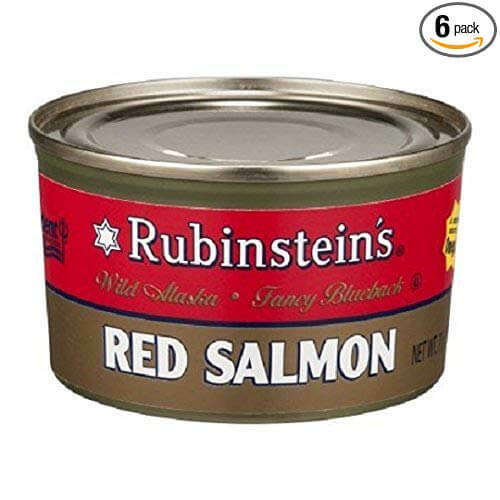 Red salmon also eat krill rather than shrimp which means their flesh is more red than pink salmon; you can see this color difference when you open a can of red salmon. Wild caught in the North Atlantic and certificated by the MSC, Chicken of the Sea Traditional Pink Salmon is a U Pareve Kosher food. A traditional salmon, it contains skin and bones, which although not all of us are fond of, it does mean that as the traditional salmon it provides more Omega-3s and calcium than skinless and boneless salmon. Chicken of the Sea is available in family friendly 14.75-ounce cans and is also a WIC (Women, Infants and Children) approved item – but do check your individual state guidelines for further information. 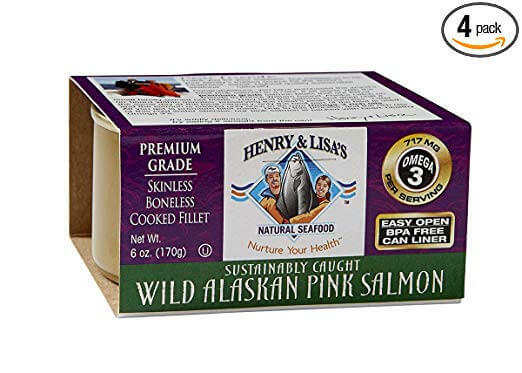 Skinless and boneless Henry & Lisa's Natural Seafood Wild Alaskan Pink Salmon is fished from a sustainable wild Alaskan salmon fishery by local fishing families. As part of EcoFish, the company aims to provide the most sustainable fish to its customers by helping support sustainable fisheries and other initiatives. Canned in BPA-free lined cans on the same day that it’s caught to maintain its freshness, Henry & Lisa’s canned salmon is also independently tested for contaminants – providing you with some reassurance that contaminant levels are below statutory limits. This salmon is also kosher certified. 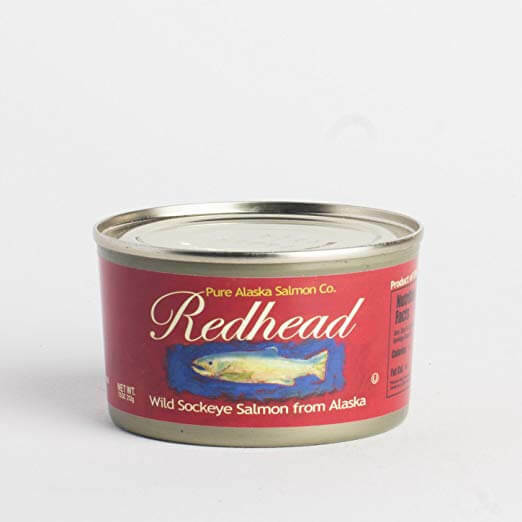 From Alaskan waters, Rubinsteins Red Salmon offers a rich Sockeye canned salmon. As well as having the highest level of vitamin D across the canned salmons, Sockeye salmon also contains more vitamin A. As it still contains some skin and bone after canning, this red salmon is a good way to top up your calcium and Omega-3s intake. If you are on a lower fat diet it is worth noting that red salmon is higher in fat than pink, although the more intense flavor of red salmon can make the slightly higher fat content more attractive. As protein levels tend to stay the same between fresh and canned salmon this makes canned salmon an easy way to increase dietary protein. Calorific content can be lower in canned salmon (probably due to additional water content). Fat, saturated fats and cholesterol levels are similar between canned and fresh salmon although there can be slight differences, so if you do have specific dietary requirements it is worth checking before you buy. Sodium levels do differ between canned and fresh salmon, with canned salmon containing a lot more salt. Whether you choose skinless and boneless or traditional canned salmon, sodium levels are around the same. If you are on a low sodium diet you may need to consider purchasing low sodium canned salmon. A serving of canned pink salmon provides around the same amount of Omega-3s as the same serving of fresh farmed or wild Atlantic salmon. Levels of vitamin B12, vitamin D are often higher in canned salmon and if you choose a traditional canned salmon rather than skinless and boneless then calcium levels can be up to ten times higher than fresh salmon. Selenium can be lower in canned salmon but it is still a good source of this trace element which is vital for some hormone and reproductive functions within our bodies. The ASMI (Alaska Seafood Marketing Institute) provide a variety of nutritional information on salmon, including a handy nutritional values table that allows you to check out key nutrients in fresh and canned salmon at a glance. Omega-3s are part of a family of polyunsaturated fatty acids (PUFAs) found in various foods. Omega-3s are needed in our bodies as they play an important role in forming the membranes or outer walls of our cells. The two forms of Omega-3 are alpha-linolenic acid (ALA) and eicosapentaenoic acid (EPA) and docosahexaenoic acid (DHA). We must source ALA from our diet, usually from foods such as flaxseeds, nuts and green vegetables as we need ALA to make EPA and DHA. Because it takes quite a while time to make EPA and DHA in the body, it is much easier to access the ready source of EPA and DHA Omega-3s from the fatty parts of cold-water fish such as salmon. There is plenty of info available on what the benefits of eating fish such as salmon are to our health and the section below looks at some of the main health benefits identified to date. At least two 3.5-ounce servings of fish a week is recommended by the American Heart Association and the AHA also suggests we try to choose fatty Omega-3s rich fish such as salmon. Research has shown that Omega-3s help to lower blood pressure slightly, decrease the risk of abnormal heartbeats, slow the growth of atherosclerotic (fatty) plaques in the arteries and reduce triglyceride fat levels. Omega-3s may help improve symptoms of some children with attention deficit hyperactivity disorder (ADHD) or related neurodevelopmental conditions and because Omega-3s are vital in the brain’s cell membranes, it is suggested that a high Omega-3 diet may contribute to reducing the risk of developing Dementia or Alzheimer’s disease. A big cause of sight loss in adults is Age-Related Macular Degeneration or AMD and Omega-3s may help minimize inflammation in the retina, reducing the risk of developing AMD as we age. There have also been suggestions that Omega-3s may not only reduce the risk of developing dry eye disease, but that they may also reduce some of the uncomfortable symptoms that this condition brings. Some research suggests that Omega-3 consumption may decrease the risk of some cancers such as colorectal and breast cancer. Other research is taking place on how Omega-3s may help reduce some of the inflammation associated with rheumatoid arthritis. Because the diets are different between wild and farmed salmon, nutritional values vary between the two types. Farmed salmon can be higher in fat, carbs and Omega-6, yet may be higher in Omega-3s, which is what we do need in our balanced diet. Farmed salmon can also contain higher levels contaminants such as polychlorinated biphenyls (PCBs) and dioxins, whereas most canned salmon is sourced from the wild meaning lower levels of PCBs. All salmon hatch in freshwater streams and rivers, migrate to the ocean and stay there for most of their adult life, returning to freshwater to reproduce (spawn) and die. Pink, Sockeye, Chinook (King) and Chum (Keta, Chub) salmon are caught in wild fisheries in the Pacific whereas Atlantic salmon tend to be farm raised. This is because commercial fishing is currently prohibited because of low wild Atlantic salmon populations. Pink salmon, sometimes known as humpback or humpie is the largest portion by weight of US salmon harvesting. Salmon are different colors due to their diet. Sockeye or red salmon feed on krill, which gives them more reddish tinted flesh, whereas other species of salmon, including pink eat varying amounts of shrimp which makes them the lighter color. Occasionally, white King salmon are available. Canning reduces flesh color further so canned salmon can look a lot paler than a fresh salmon fillet. 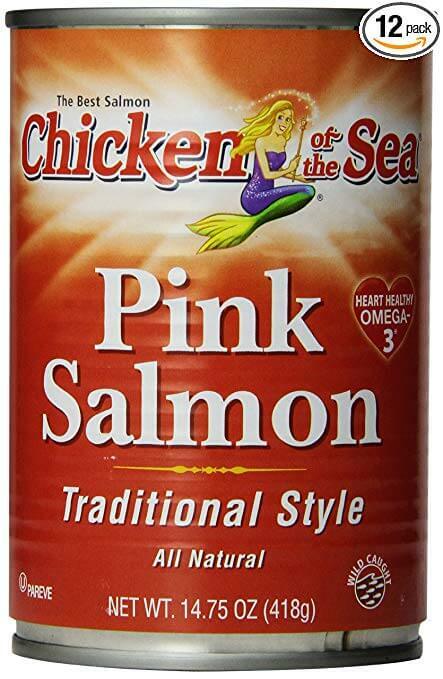 Farmed salmon is usually lighter in color as their feed doesn’t contain as much shrimp or krill, but farmers often supplement feed with a natural food colorant to give farmed salmon a pinker color. As well as the difference in color and having a richer flavor, the red salmon Sockeye tends to be bigger than pink salmon. Sockeye is sometimes known as blueback salmon due to its metallic blue tinge. Almost all fish and shellfish contain mercury, but salmon contains lower levels of mercury than other canned fish such as tuna. Mercury is naturally in our environment and accumulates in water in the form of methylmercury. Because fish live and feed in the water they absorb the methylmercury, which tends to mean that larger fish such as swordfish and king mackerel have much higher levels of mercury as they have lived longer. Those most at risk of damage from mercury are the unborn and young children. Because fish can contain high levels of mercury the US FDA advises that if you are pregnant or thinking of having a child then that you shouldn’t eat more than two to three servings of ‘Best Choices’ fish and shellfish per week. Salmon and other fish/seafood listed in this group are lower in mercury. If you have young children, then from aged two upwards, you can give then 1-2 portions per week. Some studies have shown that ensuring Omega-3s intake from fish or seafood during pregnancy may be associated with better infant health outcomes. There are many local organizations and non-profits supporting sustainable fishing in not just the Atlantic but across the globe. One of the key bodies is the Marine Stewardship Council or MSC. A non-profit organization, it focuses on recognizing and rewarding fishing that is sustainable to help improve the quality of the world’s oceans. If you buy canned salmon carrying the MSC blue label it shows you have purchased a product supporting sustainable fishing, meaning that fish stocks are being managed properly in healthy habitats while supporting the livelihoods of those within the industry. The Non-GMO Project is another non-profit focusing on non-GMO food supplies. It acts as a third-party verifier for non-GMO food in North America, allowing food suppliers to demonstrate how they are offering transparency for consumers. In summary, canned salmon, whether red or pink, low sodium, kosher or lower mercury is a versatile food and if as consumers, we choose the canned salmon that is not only right for us but is sustainably caught then we are helping slow the decline of the world’s ocean habitats which has occurred through intensive overfishing. As well as tasting great in food or even straight from the can, salmon has many documented benefits for the health of our heart, eyes, brain and more. 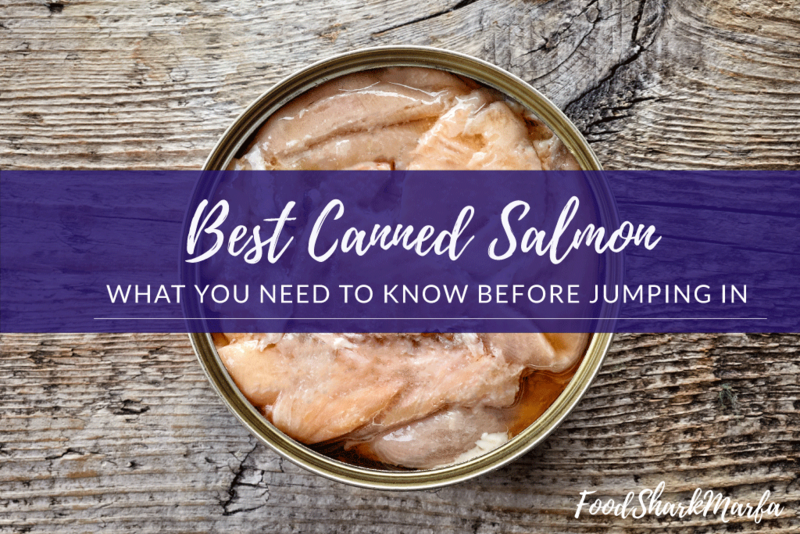 Most of these benefits stem from salmon’s high levels of Omega-3s that are not destroyed during the canning process and as a low carb, high protein food, there is no doubt why seeking out the best canned salmon is just another way that can help us in our quest for a healthier diet.